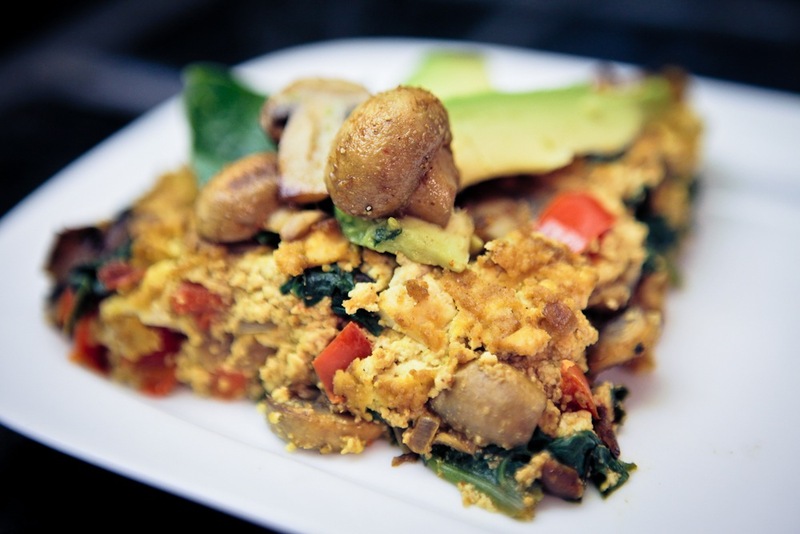 When we first became vegan, I was a tofu-scrambling machine. I researched the basics online and taught myself along the way. It was a good, easy go-to for any meal when we were still learning this new way of life, and we ate a lot of it. I scrambled the heck out of some tofu! Frankly, vegan cooking was a little intimidating to me and these early scrambles built my confidence. After I became more comfortable with my scrambles, I became more open to the idea of trying new recipes, I began googling vegan versions of our vegetarian favorites. A search for “vegan frittata” introduced me to the Post Punk Kitchen. As far as I’m concerned, Isa Chandra Moskowitz and Terry Hope Romero are geniuses. Their website was soon bookmarked in my browser’s toolbar because I was visiting their site so much and I was recently given the majority of their cookbooks (and though I have not made a lot from them, I have read them cover to cover, like novels). Every recipe of theirs that I made was downright incredible, and left me excited about things I could create in the kitchen on my own. Isa’s Savory Mushroom Gravy is my omnivore in-laws’ favorite, and after making an appearance on Thanksgiving, it was requested again for Christmas. It is because of the PPK that I became more open to trying other recipes from the vegan-cooking-blog-community (see my list to the left). 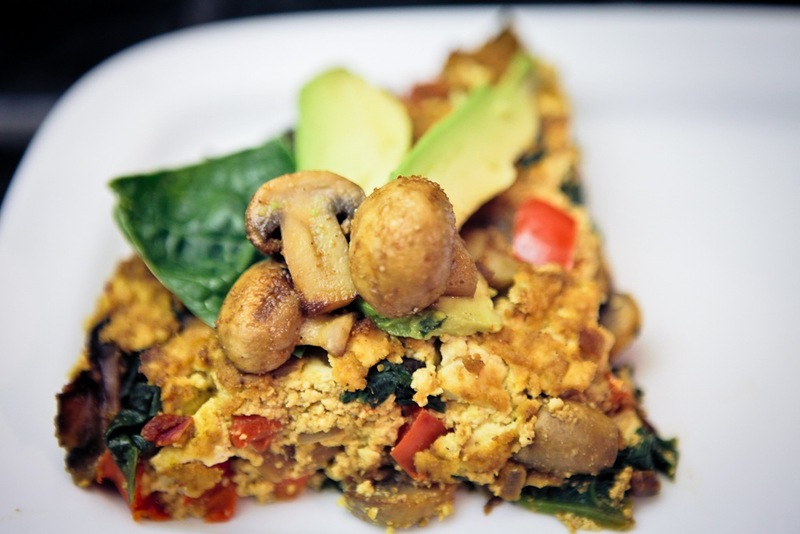 This recipe is based on Isa Chandra Moskowitz’s Swiss Chard Frittata from Vegan Brunch. I’ve made many variations of this, using the same base and whatever vegetables I’ve had on hand, and they’ve always been great. The only thing that I’ve really altered to the base is that I add a little chickpea flour which soaks up some of the moisture and holds it together a little more. For some reason, probably because I did not squeeze enough water from the tofu or perhaps left too much moisture in the vegetable mixture, without the garbanzo flour, it fell apart too easily. It tastes better than any egg-based frittata I’ve ever made, and is now a go-to for times when I don’t know what to cook. Thank you so much for being so amazing, Isa Chandra Moskowitz! 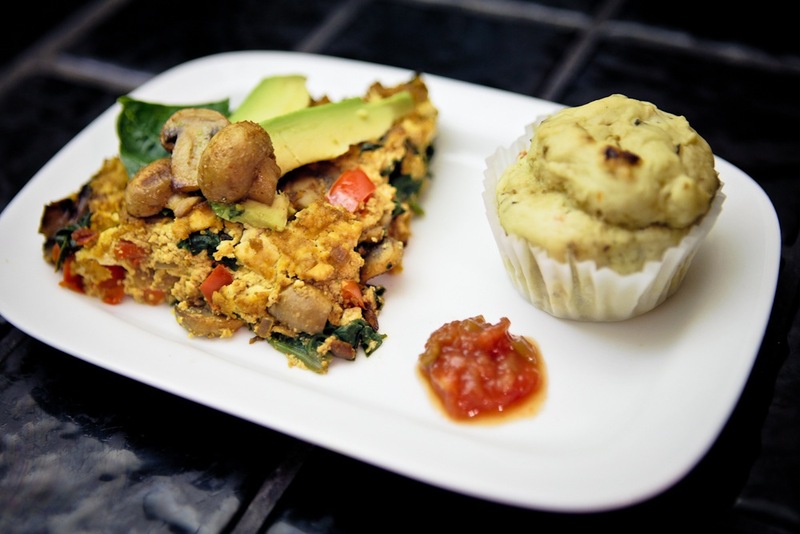 I served this particular frittata, garnished with fresh avocado and salsa, and with Sun-Dried Tomato Avocado Muffins on the side. We also ate it for dinner because if you hadn’t gathered, we like breakfast for dinner, but that’s neither here nor there. Do with it what you would like but just make it! Preheat oven to 400 F. Remove tofu from carton and place in strainer or colander over the sink or a bowl. Preheat a large pan over medium heat. Add the oil, the onion and the garlic and cook for about 3 minutes, stirring occasionally. Add the bell pepper, mushrooms, thyme, cumin, and cayenne pepper. Saute for about 5 minutes. If needed, add a little bit of water to prevent sticking. Add the spinach and sauté until spinach is wilted, about 3 minutes. Turn the heat off. While the vegetables are cooking, prepare your frittata base. Give the tofu a squeeze over the strainer/colander to remove a little of the water. Still keeping it over the strainer, use your hands to crumble and squeeze it until it has the consistency of ricotta cheese (about 3 minutes). Remove the “ricotta” tofu from the strainer and put in a large bowl. Add the remaining ingredients to the tofu and mix well. When your vegetables are ready, mix it into the tofu. Taste for salt. Lightly grease an 8-inch pie plate and firmly press in your frittata mixture. Bake for 20 minutes, until firm lightly browned on top. Let cool for about 3 minutes, then invert onto a plate and serve. Thank you for visiting Keepin' It Kind! My name is Kristy, and this is my blog, chronicling my adventures in vegan cooking, dining, traveling and other things in my quest to live kindly. Join me in making this world a kinder place! © Kristy Turner and Keepin' It Kind, 2012. Unauthorized use and/or duplication of this material (content and images) without express and written permission from this blog’s author and/or owner is strictly prohibited. Excerpts and links may be used, provided that full and clear credit is given to Kristy Turner and Keepin' It Kind with appropriate and specific direction to the original content.